At Centro Flamenco La Fuente we pride ourselves on offering a relaxed and friendly environment which is never intimidating, in which all of your energy can be focussed on developing your skills. We also keep our class sizes to a minimum, meaning that we can give one-to-one personal attention wherever possible. We offer flamenco classes suitable for all levels of experience, spanning beginner, intermediate and advanced level experience. 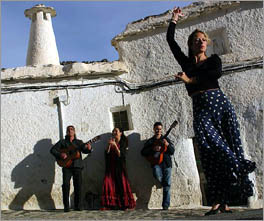 All flamenco classes take place in our own purpose-built Flamenco studio in the beautiful village of Capileira. If you have a pair of dancing shoes, bring those with you. If you don't have any, don't worry as we can provide some for you. Give us your size and colour preference when booking your holiday. The shoes are avilable to purchase at 110 euros or 40 euros to hire. Please make sure you give us your shoe size at the time of reservation. This course is for those who have never danced flamenco before, or for those who have danced sevillanas or had a few flamenco lessons but have never managed to master the basic foot tapping technique (zapateado). This course is for those who have been dancing flamenco for two or three years regularly, and have mastered the basic foot tapping technique. They may possibly already have danced tangos, alegrías or soleá, or only one of these various styles. This course is only for those who have been dancing regularly for at least five or six years. Usually the participants have danced several of the palos, or styles and can catch on quickly to the new steps. They need to have experience dancing tangos, alegrías, soleá, and bulerías. 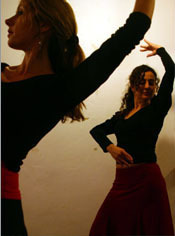 Technique: During this part of the class we deal with the coordination of different parts of the body, and the consolidation of fundamental flamenco concepts. Choreography: This focuses on the staging of choreography for different flamenco styles, ie. seguiriyas, soleá, soleá por bulerías, alegrías, etc. Our flamenco holidays run from Sunday to Saturday, with classes taking place on Monday, Tuesday, Wednesday, Thursday and Friday. Depending on your level, you will be placed either in the morning or afternoon classes, giving you half the day free for any other activities you wish to take part in. During the weeks where all students attending the school are at the same level, classes will take place in the morning. On Friday evening we hold an informal get-together with all of our students, with wine and soft drinks provided, to review and enjoy what each student has learned in the week. We will be accompanied (subject to availability) by a flamenco guitarist and singer. 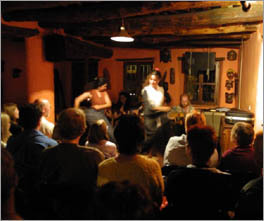 An optional excursion is also available to a local Flamenco club/bar (subject to availability), where dinner and a live performance of Flamenco can be enjoyed. Again, please note that the cost of this excursion will be in addition to the basic price of your holiday.